Institutions everywhere are pursuing sustainability projects that strengthen the campus while making the larger community more resilient. This campus is limiting carbon emissions and its dependence on third-party utilities at the same time. Saddleback College in Mission Viejo, California operates its own cogeneration plant, which recaptures the waste steam left over from electricity generation and uses it as a thermal power source. Also known as combined heat and power (CHP), the solution prevents this discharge from escaping into the environment as carbon emissions, and provides chilled and hot water across the school’s 200-acre property. Cities’ district energy networks are increasingly using what is known as “green steam” to heat buildings across town. Columbia’s academic buildings are so energy-efficient, it’s chilling. This Ivy League institution is home to numerous “green roofs” that absorb carbon dioxide and provide insulation to lower heating and cooling costs. But the bottom of the campus is just as innovative as the top: Working with Con Edison, a New York electricity provider, Columbia literally targeted its chilled water system when looking to shrink its utility bill, and installed 2,000 geothermal energy wells beneath Knox Hall that provide cooling by using the earth’s groundwater. Similar to the benefits of district energy, this eliminates the need for an onsite chiller plant and preserves the building’s original architecture. The college estimates energy savings of up to 60 percent. 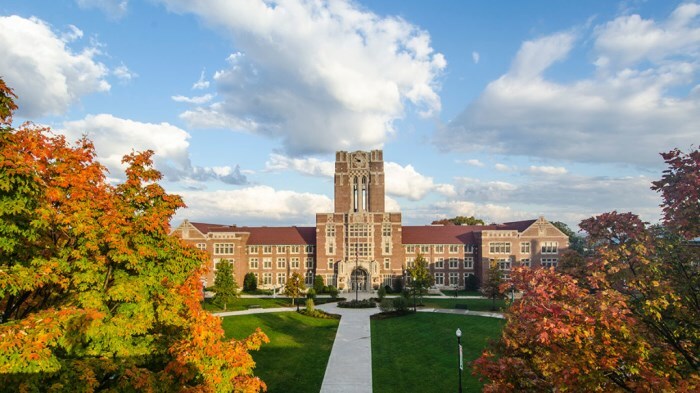 Colleges are legally required to dispose of their hazardous waste safely, but the University of Tennessee is going a step further to keep their science departments environmentally responsible. With 600 laboratories across campus, this Knoxville-based college sorts and transfers its hazmat before disposal. By diverting acids to wastewater systems for treatment, they can make city infrastructure more efficient. By moving chemicals when labs are relocated, the school doesn’t retire a product just because its facility is being cleaned out. Repurposing waste in this way is a win-win for the university and Tennessee as a whole. Minneapolis and St. Paul make up the coldest metro area in the U.S., and this Minnesota campus is doing big things to reduce the carbon footprint of its heating bill. Heating systems account for an average of 345 million metric tons of CO2 emissions each year. Along with using cogeneration, this Heartland-based school is collaborating with its own engineering students on technical solutions to further lower that number. By looking at metrics related to equipment pressure and power interruptions, the university can strike a better balance between the energy it uses and the heat it provides, lowering its net carbon footprint by up to 13 percent. This gives local interns an environmental application of their future careers and ensures UMN is as resourceful as it can be. Big environmental changes don’t just happen at the industry or government level. These green colleges show the reach of sustainability with the help of a smart, forward-thinking administration. Download our case study on Saddleback College to learn more about how colleges are doing big things for the environment.